In March 2012, two Romanians and a Serbian businessman met in a posh restaurant of the Pullman Hotel near downtown Bucharest to heatedly discuss how much to pay to bribe a judge and how to do it without getting caught. One of the men at the table was Aleksandar Andrejević, director of Mineco Ltd, a subsidiary of the Swiss-based Mineco, a multinational company in the natural resources business. Just three months before, Serbian officials sought Andrejević in connection to allegations of fraud charges but could not find him. The other two were Iacob Chişărău, at the time director of the Romanian mineral company Moldomin, and Dan Adrian Rus, the representative of the Mineco subsidiary in Bucharest. The meeting was important. At stake was at least US$1 billion in copper deposits controlled by Moldomin, a former Romanian state company now in bankruptcy. Mineco had earned the rights to exploit the copper reserves from Moldomin but those rights were under attack by the Romanian state which suspected Mineco had not won the rights fairly. The Romanian authorities had tried to block the sale of those assets to Mineco but a week earlier, the Timisoara Appellate Court ruled Mineco could continue the process of buying the assets of Moldomin. But more decisions were coming including an appeal and an attempt to replace the bankruptcy trustee of Moldomin. To make sure they got the decision they needed, the Romanians and the Serbian businessman intended to bribe Judge Cătălin Nicolae Șerban, the vice-president of the Timisoara Appelate Court. The initial contact with the judge had been made at a Masonic lodge where both the judge and Chişărău are “brothers”. The chat, which was surreptitiously recorded by Romanian prosecutors who were following some of the men, provides a rare glimpse into the ongoing, multi-national struggle to control mineral resources of Eastern Europe. Corruption in the extractive industries is not rare. Minerals are often one of the most reliable sources of foreign income available to Eastern European governments but many assets are being lost to unscrupulous businessmen through bribery and corruption. The Organized Crime and Corruption Reporting Project combed through records in Russia, Serbia, Romania, Switzerland, the United Kingdom and Cyprus to uncover the players. They included members of Masonic lodges, a Russian deputy from President Vladimir Putin’s United Russia party and others. The job was tricky. The men’s discussion started at least six days before the Pullman meeting when Andrejević told Chişărău in a covertly recorded meeting that his boss Dimitrije (Miki) Aksentijević preferred if the bribe money came through a bank account and not in cash. Chişărău, however, told him he was afraid that the withdrawal of a large amount of money from the bank would attract the attention of the authorities. The Serbian, however, assured him that they knew how to do these things. At the Pullman meeting, they decided that Chişărău would pick up the cash in Serbia, and get it to the judge. Andrejević told the Romanians he would not personally attend the meeting in Serbia but he added that someone else will take his place. Two days later, Chişărău crossed into Serbia entering Bela Crkva, a small town of 8,000 about 10 kilometers from the Romanian border. With him was the chief of police from the Moldova Nouă, a city in Romania near the Serbian border. The two shopped for about an hour, and then at 4 p.m. they stopped near the Hotel Royal on the edge of town. Waiting for them was a black jeep 4×4 with two strangers inside and an envelope stuffed with Euros. Chişărău took the money and returned to his car. It took less than two minutes. But what Andrejević likely didn’t know was that Chişărău was stopped shortly after upon entering Romania. Romanian law enforcement found €50,000 on him. The Romanian businessman wasn’t arrested but rather cooperated with police and followed the plan to deliver the bribe. That same day, the money was marked with the words “trafic de influentă”- Romanian for “influence peddling” — in ink visible only under a special fluorescent light. The envelope did not go directly to the judge, however. According to prosecution statements, he asked Chişărău to leave the cash at his wife’s public notary office possibly as an attempt to disguise the bribe as a fictitious transaction. Despite the detour of the payment, the judge was arrested. Mineco expected him to do a lot for the money: influence his colleagues on the appeals court in not one but two cases. The first was to deny an appeal by the Romanian tax office on the sale of Moldomin assets; and the second was to block a state effort to replace the trustee handling the sale of Moldomin assets in the bankruptcy proceeding. That trustee, Răzvan Traian Zăvăleanu, had originally handed Moldomin over to Mineco. As it turned out, the judge was not only arrested for his efforts, but was stiffed on the payment. The envelope was short of his demanded payment by €10,000. Andrejević and Aksentijević, left Romania on the day of the prosecutors operation. They are currently under investigation. The other accomplices were sentenced this year by the High Court of Cassation and Justice. On June 18, Judge Șerban was convicted and sentenced to five years in prison; Dan Adrian Rus got a two-year suspended sentence, while the judge’s wife got a three-year suspended sentence. In a separate trial in February 2013, Chișărău was sentenced to three years in prison. Efforts to gain control of Moldomin go back years and involve a confusing web of players, nations and companies, including one that used to belong to the notorious American financier Marc Rich. Rich, who died earlier this month, was the founder of Glencore, one of the world’s largest trading and minerals company. Both Rich and Glencore have been involved in numerous controversies over the years. Andrejević, who is being investigated in Romania for his role in the bribery, is also being investigated in Serbia for an allegedly fraudulent privatization involving Mineco. Serbian authorities initiated the case in November 2011. His boss, Aksentijević, is a member of the board of directors at Mineco AG, a company established in 2002 in the Swiss canton of Zug. He is a dual British and Serbian citizen who also used to work for Glencore. He is also the son of Dragan Aksentijević, a former director of Aviogenex, a state-owned charter airline in former Yugoslavia and part of the Genex group, one of the main trading houses in the former communist Yugoslavia. 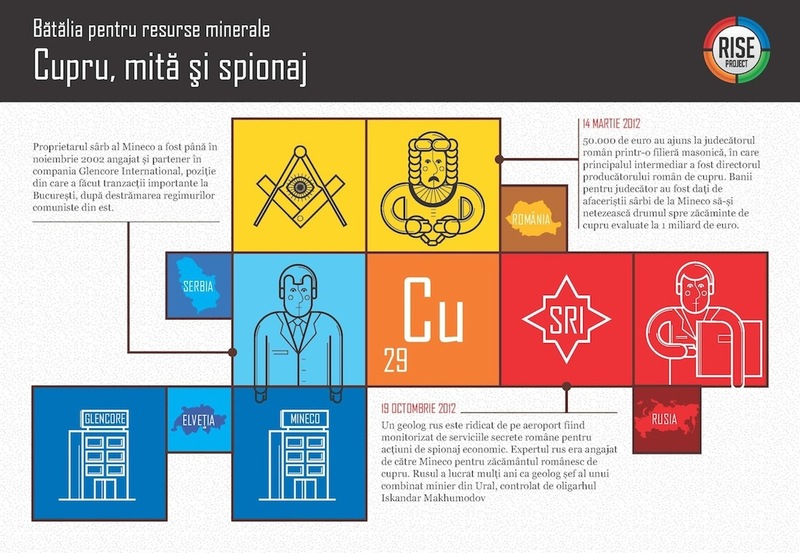 The Serbians through Mineco originally targeted Moldomin in 2006 when Mineco, together with a local company called Metanef, participated in an initial offering bid to join the Romanian state in exploiting the copper reserves. At the time, Rus was an executive in the Metanef group. Like Mineco, this Romanian company was previously connected to Glencore. This attempt failed. A new opportunity arose in 2010, when Moldomin collapsed under its burden of debt. The state-owned company owed near €50 million to the state budget. The collapse occurred despite Moldomin’s huge mineral assets. The company has exploitation rights over a large territory situated north of the Danube River. Today, Romanian authorities are trying to prove that Mineco’s control of Moldomin assets was not done according to regulation. This is not the only controversy Mineco has been involved with in Romania. In October of last year, a middle-aged Russian geologist with grey hair and a thick mustache arrived at Henri Coandă International Airport in Bucharest for a morning flight. Romanian law enforcement approached him as he waited for his plane. Their search found what Romanian authorities would later claim was classified geological maps. A week later, the Directorate for Investigating Organized Crime and Terrorism (DIICOT) and the Romanian Intelligence Service (SRI) announced that they had uncovered espionage and a threat against Romania’s national security. They said the maps contained classified information about copper and rare metals reserves in the Moldova Nouă area. However, the charge was later changed to corruption. At the center of the investigation was a Russian citizen described by officials only as “O.M.”­ Russian citizen, 42 years old”. OCCRP has identified the man as Orlov Mikhail, a geologist who was part of a team of Russian mining experts brought to Romania by Mineco’s Aksentijević. Prosecutors confirmed the identity. OCCRP learned the expert team was led by Ilyas Abdrakhmanov, 62, deputy of the Republic of Bashkiria, a Russian Federation Territory, and a member of Putin’s United Russia political party. The case is currently under investigation.